Apart from helping out in the kitchen for the first night of Mille Alba, I went more than a year after Paris-Brest-Paris without riding any brevets at all. Ultimately I thought it would be a shame to skip the season entirely and booked onto the Erit Lass 200km out of a combination of nostalgia, interest in a few new roads, and feeling like I was keeping my eye in! The route was pretty simple in principal, being a figure of eight between four Scottish towns: Musselburgh – North Berwick – Innerleithen – Duns – Musselburgh. The climbing mainly hits you at the end too, over the Lammermuirs – at least it finishes with quite a lot of downhill! It was a nice crisp day and I realised on seeing the usual familiar faces at the départ that I’ve missed coming on these rides quite a lot. 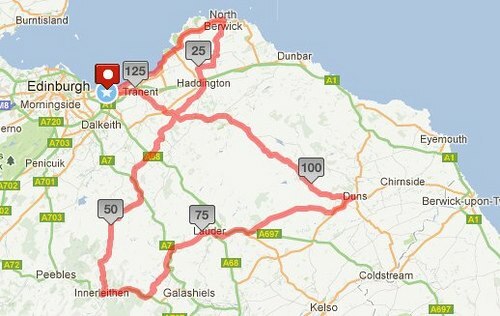 Since I rode PBP CityCyclingEdinburgh has quite a few new brevet riders and I haven’t done any! Feels like a 2012-2013 SR should be on the cards to get me back into distance riding! 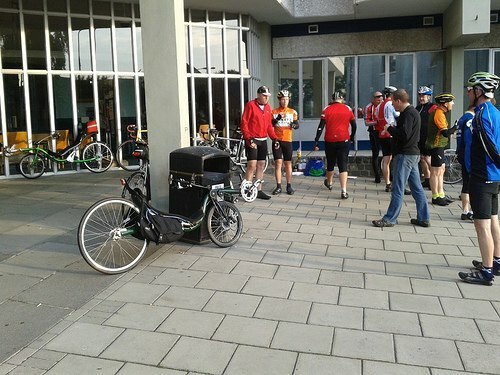 The ride started with a big pack pulling up the road, which is pan flat all the way to North Berwick. After briefly hanging on, David and I dropped off the back to ride at our own pace (we caught a lot of people at the first control and a few in the cafe at Innerleithen). Apart from one or two short sharp shocks not long after turning inland (including a ford!) 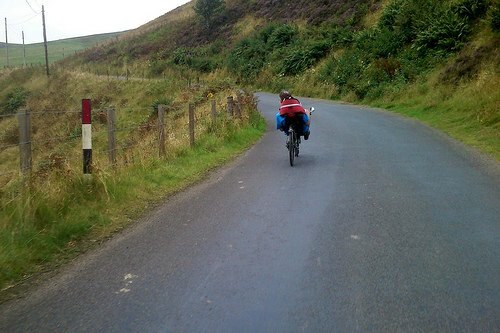 there isn’t much climbing to be done before you get to Innerleithen, with the long winch up the B709 consisting of a very shallow gradient – we were being pummelled by a stiff headwind by this point but still making excellent time. If you’re passing by at lunchtime, this is a highly recommended stop! Stiffer climbs from the A72 to A7 and from the A7 to A68 put our endurance to a sterner test, although the descents were amazing fun and another reminder of the lowracer format coming into its own – I’d never risk some of those speeds leading with my head! Shortly after Lauder we joined the A697 for three rather unpleasant miles – it’s not the biggest road but was made much worse by a couple of dumbstruck drivers who more or less refused to pass us, leading to a huge queue of frustrated people eventually blatting past, instead of a steady trickle and no problem. Mile upon endless mile on the deserted B6456 with a stonking tailwind quickly made up for this, followed by a cheeky half of lager shandy in the pub in Duns! Finally it was time to turn back into the wind, towards Musselburgh with the giant barrier of the Lammermuirs between us and our final destination. There are two distinct climbs, one between Duns and Longformacus and then a final, multi-stage effort to the summit of Redstone Rig. With my Raptobike featuring quite an ambitious bottom gear (somewhere in the mid 30″s) I had to resort to a few handstands to get me up amidst some worry over my knees (which turned out to be fine). 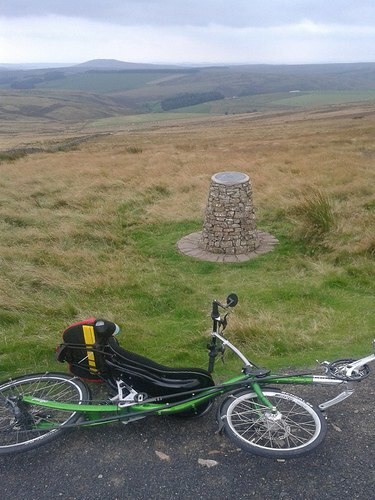 Even our bikes needed to rest at the top of the Lammermuirs! Now being hammered by strong side-winds we plummetted like stones through Gifford and across East Lothian. Unfortunately at this point we started to get a bit of rain, which is rather unpleasant with your head a few cm from the back wheel (normally I would have had the tailbox, so never fitted mudguards). 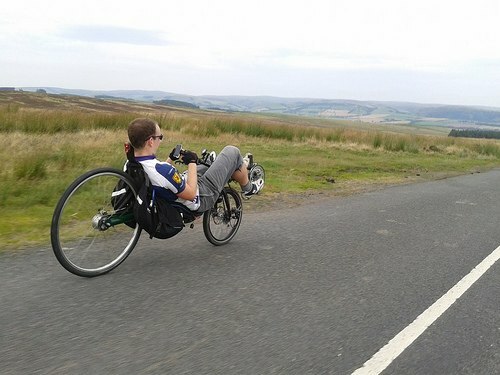 Driving standards were at their usual low in East Lothian and I had a close shave stopping for a red light which some berk behind me wanted to run, but by and large the recumbent effect cancelled this all out and we made it back to the hall in Musselburgh in time for soup and pie! 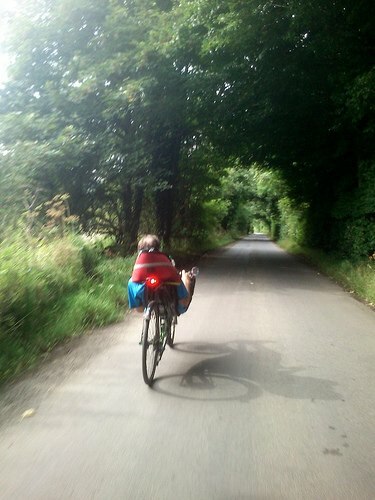 An excellent reminder of why I love distance riding so much and one which has got me committing to my next brevet bike after a year in the doldrums- watch this space!